Now that your little one is off breast milk or formula, making sure she or he is receiving all the proper nutrients takes a little bit more thought. Ensuring proper nutrition for kids doesn’t have to be complicated – their needs are pretty much the same as yours, just in smaller portions. Also, feeding a toddler a well-balanced diet will help establish healthy eating habits early on. Feeding your toddler a variety of foods from all the food groups will help instill the need to make the right food choices when they get older. 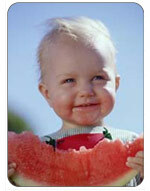 By the time your child is two, she or he will be eating mainly solid foods. To figure out how many calories your child needs everyday, just use this simple equation: for every inch of their height, your child should consume 40 calories. So, if your daughter is 35 inches tall, then she needs 1400 calories each day. Not all calories are the same, though. Therefore, it is recommended that the largest amount of calories come from dairy products, about 40% of the total number of calories. Grains and protein products should account for about 20% each, while fruits and vegetables should make up the remaining 20% of your child’s caloric intake. Also, 30% of your toddler’s calories should come from fat (they need that fat to feed their endless stores of energy). Even though dairy products consume the most calories, it is in fact grains that your child should receive the most servings of. Up to six servings a day of grains is recommended. Your toddler will also need four servings a day of dairy products as well as an additional four servings of fruit and vegetable products. Protein packed foods should show up two to three times a day in your little one’s meals. But remember, these servings are not adult-sized portions. In fact, a serving for a child is anywhere from a quarter to half of an adult serving. Your two-year-old won’t be able to finish off that 12-ounce steak for a few more years, so just give him a little three-ounce piece for now. Also, keep in mind that your child’s appetite will change from day to day. Some days she may just eat a few things while the next day she just keeps asking for more. It’s all perfectly normal. Her appetite will probably also increase when she is going through a growth spurt. There are a number of nutrients that all toddlers need to ensure their healthy development. Iron is a big one since this helps to promote their brain growth. By your child’s two-year birthday, she or he will need to have about 10mg a day. Iron received from meat is the easiest source for your child’s body to absorb. Iron is also found in grain and vegetables products but this iron isn’t absorbed as effortlessly. It’s a good idea to serve these items with a source of vitamin C to help make absorption less difficult for the body. Three ounces of steak or hamburger contain about 2 mg of iron while three ounces of chicken will have almost 1mg. One egg has .6mg of iron. Zinc is another important nutrient that helps promote healthy growth in your children. Your toddler will need about 10mg of zinc everyday. Some foods that are good sources of zinc include baked beans and ricotta cheese (both have 2mg in a half cup serving), steak and hamburger (a three-ounce serving of either meat contains between 4 and 6mg), and pecans (a quarter cup contains 1mg). Vitamin D is an essential nutrient to help with calcium absorption. About 200IUs is the recommended daily intake for toddlers, which can easily be gotten from salmon (three ounces has 155IUs), one cup of milk (98IUs) or a slice of cheese (69IUs). Vitamin A is another important nutrient for your child’s healthy development. This vitamin is responsible for protecting against infections, improving the condition of hair, skin and nails and helping eyesight. While vitamin A can be received from a variety of sources, getting too much from meat can result in health problems. However, vitamin A derived from vegetables poses no problems as the vitamin comes from carotenoids. Your toddler will need about 400 micrograms each day. Some great sources of vitamin A include carrots (one raw medium carrot has 2000mcg! ), red bell peppers (a half pepper has 339mcg) and eggs (84mcg). One of the most wondrous vitamins out there is vitamin C. Just a few of the things this vitamin is responsible for include boosting the immune system, repairing red blood cells, helping gums stay healthy, and making it easier for the body to absorb iron. Even though your toddler needs between 15 and 40mg every day, vitamin C is incredibly easy to get. A half-cup of red bell peppers has 142mg while one cup of orange juice has 100mg. Other good sources include one medium orange (70mg), a half-cup of broccoli (62mg), and strawberries (5 contain 51mg). Having all these guidelines and daily requirements to meet can seem overwhelming, but it doesn’t have to be. The easiest way to meet these requirements is by simply serving your toddler a well-balanced meal that has a little bit of each food group at every meal. Read about the importance of serving healthy meals to your toddler.